vacuum pressure, a wet thin-film is formed on the permeate side of the membrane. At the wet thin-film, the permeated solvent evaporates leading to ideal conditions of continuous nucleation and crystallization of solutes. As a result, both solvent and dry solute are separated in a single-step. 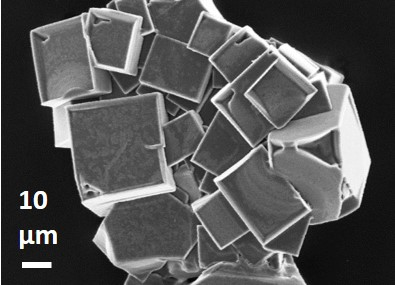 The percrystallisation process delivers small NaCl crystals varying between 10-30 µm as displayed in Fig. 1. This concept is demonstrated for the percrystallisation of mineral salts, food and pharmaceutical compounds. Fig. 1. Percrystallised NaCl crystal morphology examined using a Jeol JSM-7001F SEM with hot (schottky) electron gun at an acceleration volatge of 5kV. Joe da Costa is a Professor in the School of Chemical Engineering at the University of Queensland, Brisbane Australia. He is also the Director of the FIM2Lab – Functional Interfacial Materials and Membranes Laboratory. He was also a holder of an Australian Research Council (ARC) Future Fellowship. Joe has over 30 years working experience in industrial, consultancy and academic roles in Brazil, England and Australia. 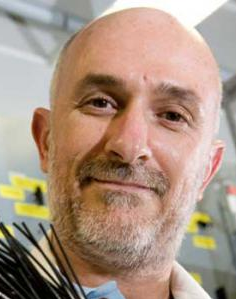 Currently, he leads several research projects in the area of H2, CO2, O2, ethanol separation and desalination using inorganic membranes and membrane reactors, in addition to environmental catalysts for wastewater processing and nanomaterials of CO2 sorption. Joe has over 250 international publications including 13 book chapters, and he is an editorial board member of Nature’s Scientific Report open source journal. His work has been cited over 8200 times, and his h-index is 47. He is a Chartered Professional Engineer in the Colleges of Mechanical Engineering and Chemical Engineering of the Institution of Engineers Australia.